BLAEU - Tartaria sive Magni Chami imperium. BLAEU, W. - Tartaria sive Magni Chami imperium. Tartaria sive Magni Chami imperium. 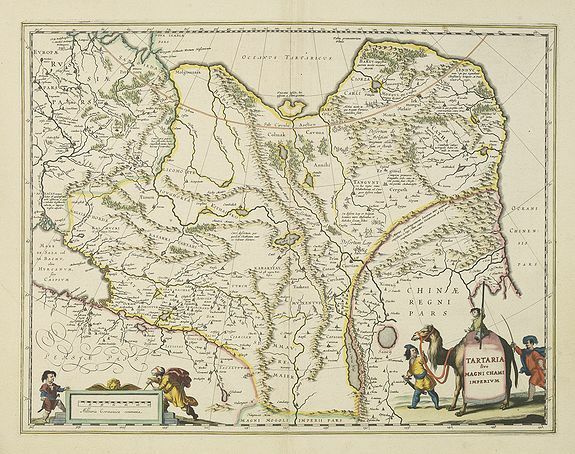 - BLAEU, W.
Title : Tartaria sive Magni Chami imperium.. Size : 15.0 x 19.8 inches. / 38.2 x 50.2 cm. Description :Detailed and decorative map of Tartary and Northern part of China. Northern tip of Korea included. The Chinese Great Wall is depicted, with Central Asia, extending from Mongolia and Xanadu to the Caspian and the Volga River and to Tibet and the Upper Ganges River. The title cartouche appears on a banner carried by a camel led by natives. As Willem Blaeu died in 1638 most of his maps are actually published by his son Joan. This map was actually published in volume II of a French edition of his "Le Theatre du Monde ou Nouvel Atlas", dated 1638, therefore published the last year of his life. Condition : Very good condition. Printed on heavy paper. Very good and dark impression. French text on verso.